This great-looking load should be placed out-of-service for violations. How many can you spot? You can hide a multitude of sins inside a van trailer, but with an open deck trailer, any indiscretions are out in the open for all to see—including DOT roadside inspectors. Staying compliant means having an excellent understanding of the regulations as well as cargo securement equipment that is up to the task. Keith Kerns, an investigator with the Public Utilities Commission of Ohio and a member of CVSA’s International Safety Team, says the primary cause of cargo-related citations and out-of-service orders is not driver error or improper methods. It’s the equipment itself. The two are related. If a driver correctly calculates the aggregate working load limits (AWLL) but uses sub-standard or under-rated equipment, he could still be cited, because the AWLL might be below minimums. That could result in one of several citations being issued, such as damaged securement systems, insufficient tie-downs or even cargo not immobilized or secured. For example, a 5/16-inch grade 70 Transport chain has a Working Load Limit (WLL) of 4,700 pounds, but if it’s not marked as such, or the markings are not legible, an inspector would downgrade it to the equivalent of Grade 30 chain, which has a WLL of just 1,900 pounds. Similarly, unmarked webbed cargo straps in good condition are minimum-rated at 1,000 pounds WLL per inch of width. A properly marked 4-inch strap could be rated as high as 5,400 pounds. If that 5,400-pound strap were downgraded 4,000 pounds because the label or marking was missing or not legible, the driver could come up 1,400 pounds short per damaged strap in meeting the minimum AWLL for the cargo. Damaged straps could be downgraded or zero-rated, depending on the extent of the damage, as determined by the strapping defect table in CVSA’s Out-of-Service Criteria handbook. “You can have a minimal amount of damage to the strap, and there are many variables there, but if the strap is so damaged that it meets the requirements of the defect table, the strap would be zero rated. In other words, it would be like that strap wasn’t even there,” Kearns says. Ralph Abato, vice president of international sales at Ancra International, says drivers sometimes shoot themselves in the foot by using extra straps over a load. He advises going through your inventory and getting rid of all the damaged or worn-out devices and replacing them with good ones. A common driver violation is not using the correct number of tie-down devices for the cargo. 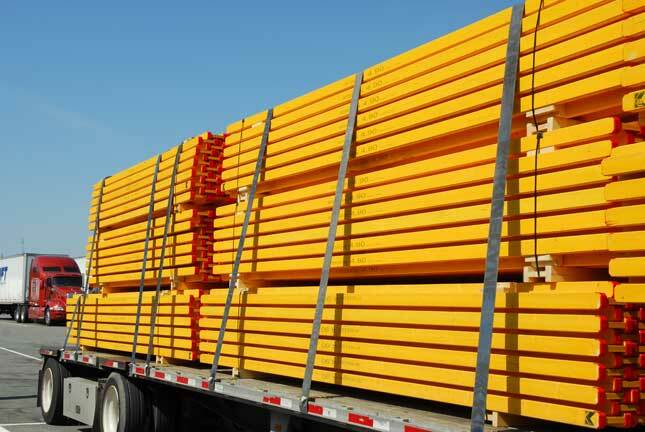 The driver has to consider the weight and length of the article(s) of cargo, and use the correct number of the proper tie-downs. Weight also must be considered. Enough tie-downs are required to secure for half the weight of the article of cargo. For example, something weighing 20,000 pounds would require a minimum of 10,000 pounds WLL of cargo securement. Using the indirect method (over the cargo, anchor point to anchor point), two 5,400-pound rated straps (2 x 5,400 = 10,800 pounds AWLL), or three 4,700-pound-rated chains (3 x 4,700 = 14,100 pounds AWLL) would meet the AWLL requirements. In this case, two 4,700-pound chains would give you only 9,400 pounds AWLL; you need to secure for 10,000 pounds. If the article was more than 10 feet in length (even if it were just 10 feet 1 inch), it would require an additional strap to satisfy the length requirements, as above, but the three chains would suffice. If that article of cargo were a machine with built-in attachment points, and the driver used the direct method (a chain from a trailer anchor point to a cargo attachment point), five direct attachments would be needed—or four direct and one indirect. When using the direct method, each tie-down device only gets half its rated working load limit. So, if the devices are rated for 4,700 pounds each, they would get a 2,350-pound allowance (5 x 2,350 = 11,750 pounds AWLL). Four 4,700-pound chains would give you only 9,400-pound AWLL. Cargo securement isn’t rocket science, but there’s too much to be taken into account to let poorly trained drivers or sub-standard tie-down equipment ruin your company’s safety record. The load appears to be unitized bundles stacked three layers high, so they must meet 393.118 and, accordingly, have tie-downs on both the second and third layers meeting all requirements of 393.100 through 393.114. While difficult to see in the photo, the strap labels are badly frayed and the WLL markings are all but invisible. The WLL of the straps could be downgraded by inspectors. The cargo straps should be strung inside of the rub rail “when practicable.” In this case, it would have been practicable to route the straps accordingly. From the February 2012 issue of HDT — Heavy Duty Trucking. Used by permission.